Page 7 of the March 4, 2010 issue of the San Diego Reader. The Reader broke a story today about a scandal that involves the firing of a whistle-blower by Mayor Jerry Sanders’ office because the whistle-blower was cooperating with a law enforcement investigation into the business dealings of a friend of Sanders’ with the City of San Diego. The whistle-blower, deputy director of the City’s Economic Development Division, Scott Kessler, was fired in the Fall of 2008. He has since filed an unlawful termination suit against the City and he and his lawyer are currently involved in settlement negotiations with City lawyers. This is great. Scott Kessler is a very good friend of mine, and I have been after him for a long time to go to the press with his story – which I thought would be the scandal of the year. None other than the old-hand and experienced Don Bauder is telling Scott’s story. The scandal has connections to Ocean Beach. Not connections that are currently tied into the gory details of this scandal, but connections that are remarkable in that they exist. This current scandal of Jerry Sanders’ involves two men – both of whom lived in OB during part of their youth and both of whom were involved in community organizing here at the beach. Both men, now in their prime, had taken the organizing experiences that they learned in OB and used them to build their different but parallel careers. One of them used his OB experiences to eventually carve out a small business empire, and the other, after his long march through the non-profit world, used his organizing acumen to achieve a reputable position with the City of San Diego overseeing public monies going to small businesses. Scott Kessler has connections to Ocean Beach. He once lived here as my roommate back in the early eighties. I met him at an anti-draft organizing meeting up at UCSD in late 1979. President Jimmy Carter – in his saber-rattling days – had called for a national military draft while racketing up the Cold War with more heat. And young people responded – in opposition. At first, I joined Scott and a group of UC-based activists in doing anti-draft work in San Diego. I recall driving all around town one day in Scott’s jeep – a jeep that he saw go over a cliff on a Colorado mountain – going from Post Office to Post Office, helping coordinate activists talking to young men about the draft. Eventually, I recruited Scott to move to Ocean Beach and do community organizing. We lived together as roommates until his first marriage and his move to Golden Hill around 1984. Initially after he had moved to OB, Scott got involved with our group, the Borderlands Education Committee – a bunch of OB activists doing work within the Anglo community about the role and history of Mexican-Americans in this country. Our work morphed into a progressive magazine, “The Whole Damn Pie Shop“, which at its peak, was publishing half a dozen times a year and being distributed up and down the Southern California coast. Kessler was able to help us with the distribution of our ‘zine as he worked in delivering products of the worker-owned Rebel Bakers, a vegetarian bakery in OB. He made deliveries up and down the coast, and would drop off our material in every coffee house and hippie store for a hundred miles. Rebel Bakers was a wonderful place. When it first opened somewhere around 81 or 82, it was in the storefront where the cleaners now stand on the alley at Cable between Newport and Santa Monica. It later moved to Bacon, right off the alley between Newport and Niagara. An actual collective, its half-dozen worker-members cooked, delivered and sold all kinds of baked goods from veggie pizza and sandwiches, to sugar-less sweets. It was a hustling, bustling place, with flour everywhere. Somewhere in 1982, Scott got heavily involved in the anti-nuke movement – the activist magnet during Ronald Reagan’s own war-mongering days. That type of committed activism was all the rage in those days – and rightly so. They were truly dangerous times. Kessler’s community involvement broadened here in OB when he became president of the board of directors of People’s Food Store. He had been hired as a consultant to assist them incorporating as a co-operative. Kessler had plenty of that kind of experience up at UCSD – where he was instrumental in beginning two student cooperatives on campus. One of them, Che Cafe, has become world famous as a venue for musical bands who later make it big. Finally, Kessler moved out of OB, and he then later became very active in a series of non-profits, first the Golden Hill Community Development Corporation, then the Adams Avenue Business Association, and through a couple of marriages, three kids,moving up to becoming executive direction of the BID Council – BID stands for Business Improvement District. And from there, he was brought into working within the City overseeing the very business districts that he had been coordinating. And it was from these last two positions, where Kessler witnessed the shenanigans that make up the story, his firing and the subsequent scandal. 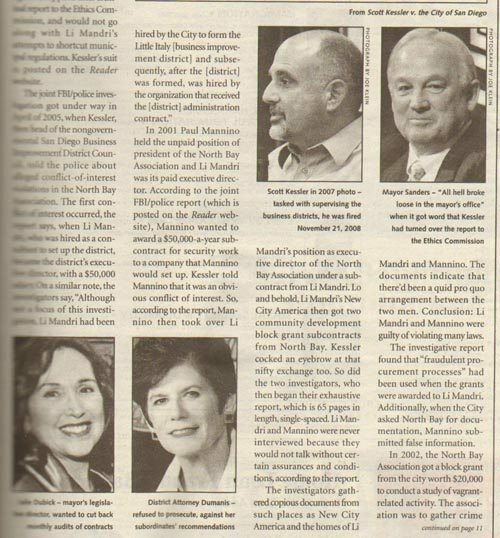 One of the other Ocean Beach connections involves Marco Li Mandri – the friend of Sanders that Kessler claims cost him his job and who Kessler accuses of being responsible for the shenanigans that were the focus of the investigation by the FBI and city police. The only other OB link is really not an OB connection but more of a Point Loma – Mid-Way link. And it involves Joe Mannino, an associate of Li Mandri’s who’s been a player in redevelopment plans for the Sports Arena area. More on that later. Marco Li Mandri also lived in Ocean Beach as he moved here in the mid-1970s as a community organizer. Marco is also an alumnus of UCSD, and ended up relocating to OB as a result of participating in an anti-CIA coalition that had jelled from OB activists and UCSD students. Li Mandri, who used to wear a small red star on his shirt lapel, became involved in local OB politics and published a small broadsheet for the community called “the OB Streetlight” for a brief period. After being part of a tiny collective of OB radicals – which I was one – Li Mandri sprang out of OB, and dove headlong into other political groups, winding up in local Democratic Party politics, where he set up the Progress for Labor club. It was around that time that Marco and I stopped communicating. With time, Marco ended up on Adams Avenue producing pasta and running a store. He gravitated into non-profits and business districts from there. And it is there, among the myriad business associations that he has set up, including his own Little Italy series of groups, that he now stands accused. This amazing story has all kinds of angles. There’s the North Bay redevelopment skirmishing that enveloped Joe – aka Paul – Mannino. There’s the refusal of District Attorney Bonnie Dumanis to conduct any further investigations or prosecutions of Sander’s friend, Li Mandri, who incidentally contributed to Dumanis’ election campaign. There’s also the lack of any FBI follow through. There’s so many angels. But it’s ironic that our little beach paradise was the once home of the players in Mayor Sanders’ current scandal. Both Scott Kessler and Marco Li Mandri cut their organizing teeth in OB after moving off the campus of UCSD. But one has continued over these past thirty years to help and build the community known as San Diego while the other has changed and now stands accused of fraudulent business dealings with that very same city. quite a timeline….thanks for the background on this frank. obviously, its not really surprising to me that theres corruption in Sanders’ office. I dont really think hes the kind of person who puts his office before himself. Ahhhhh if only Bert Decker were alive to hear the news about Mannino. Bert knew Mannino was a crook and he told that to face! Bert also felt Mannino was backed by some fine San Diegan Politicians. Many people went to the North Bay Pac meetings and saw the finaglings out in the open. I do believe some of these meetings have video taped. Maybe the Feds may want to view these??? Looking back over what I wrote, I realized I really skimmed over major areas of Scott’s life post-OB – like his union organizing work and the art projects he was engaged in. I got Scott his first job in union organizing, with SEIU Local 102 (now defunct). Ahh, if only our old friend Peter Zelen had seen all of this…. You make a good point, the relationship between UCSD and Ocean Beach. Periodically, there’s been waves of student activists from UCSD who settle in OB and contribute to the community organizing experience. In fact wasn’t the original OB Rag part of a “wave” of UCSD students coming into OB? Oh yeah, I too remember Rebel Bakers and its great vegetarian pizza! hello? is anybody listening? mayor/crooks/district atty/coverup…. see if you can make the connections! This is the sleeper scandal of the year. You’d better read up if you think the strong-mayor form is good for ol’ San Diego. And then ask why other press and media have not picked this story up. You are right on the money Molly. The cast of characters is pretty interesting- Bonnie Dumanis, Ethics Committee, FBI, and the Mayor’s office. The silence is deeply disturbing. The City is moving ahead on out sourcing. Can’t wait to see how all these folks screaming for small government line up at the public trough for contracts. And it will be very interesting to see what kind of oversight will be provided by the City. Scott Kessler won’t be there doing it, will he? And yes, we should be giving some informed thought to the strong mayor vote coming up. Hey, check it out! There’s more on this scandal in this weeks Reader, 2 letters, including a rant by one of the people involved and some info by Matt Potter. I know Scott many years ago, connected with Adams Avenue and Landmark Theaters. He’s brave and he’s good. I want him to be our next mayor.